Android platform has become more popular and it holds a maximum number of Users when compared to all other platform. Before the introduction of the Android Operating System the access to the Library documents was done only by the librarian. This paper suggests a method for the library access to go public that is the public can also access the library database. The Library Access Application helps the patrons to access their required information and queries without computers or the librarians but through their android devices which saves their time and energy. The Application retrieves the information stored in the library database through the library server for example checking whether the books are available in the library or borrowed without intervening anyone. User’s access of library will be stored in the database for suggestion during a search for books. Due-date of the borrowed books from a library will be intimated by the app as a notification prior to the deadline. Users are privileged to suggest books for the library and they are notified about their suggestion, by the Librarian. This paper brings a new idea of the public to access the library. The project titled “Library App” is Library management system for monitoring and controlling the transactions in a library. 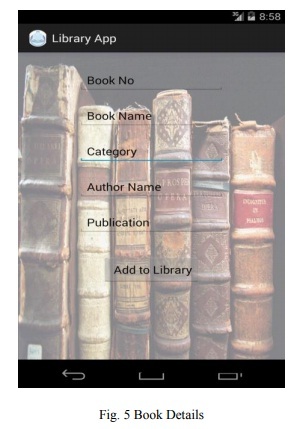 “Library App” is a java application, designed to help users maintain and organize library. A library is a collection of sources of information and similar resources, made accessible to a defined community for reference or borrowing. The server keeps track of all the information about the books available in the library. The user will find it easy in this automated system rather than using the manual writing system. The system contains a database where all the information about the user and the study materials will be saved safely. This App allows the students to download the study materials such as previous year question papers, lecturer notes, lab manuals and all the study materials can be downloaded and used offline .This App also provides a e- reader facility for the limited books so that every student get a chance to access the book anywhere and anytime . We developed this Android App with the concepts of Java and xml. This project is designed & coded in “eclipse and android studio” & database management is handled by MySQL 5.0. 1. Allows checking the availability of books in library. 2. Allows user to log in using username and password. 3. The user can access the previous year question papers of different schemes. 4. The user can download the lecturer notes for every subject in a semester. 5. The user can download lab manuals for the respective laboratory subjects. 6. The user can download a e- books of various authors. 7. User can download all the study materials and view them offline. 8. All information about competitive exams can be accessed. The user can check the availability of the books in library online. if the book is available the status will be "available " and if book is not available then status will be "Taken"
If the Admin clicks the enter new book details he will be directed to the above screen shot page where he should enter the fields such as book no, book name, category, author name and publication. After entering all the fields he should click the button add to library in order to add the book details in the database and also to make the books available to the Users. 1) The main aim of the application is to make people to easily access their library account in order to check the availability of the books in the library. 2) This application in android allows the users and library administrators to access library access system through android Smart phone instead of computers. 3) The User can suggest to the Librarian if the desired book is not available in the Library. 4) The Computers available in the Library can be replaced with the Android Device such as Tablets, phones that saves capital investment. 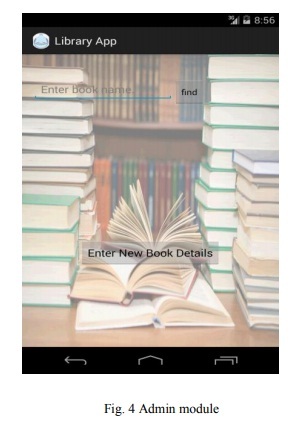 2) Only the Android Users can use the Library Access Application. 2. Online Mock test can be given to a student's so that students get a practice before attending to final exams. 3. IEEE study materials can be viewed from this app. 4. The bar code scanner can be used by the librarian in order to borrow the books. In order to improve the efficiency of data processing, cloud messaging can be used. In this paper we have presented a Library Access System Application, developed for Android using SQLite Database. The main aim of the application is to make people to easily access their library account in order to check the availability of the books in the library. The Library Access System Application saves Users estimable time by making complete procedure online. The problem of data storage is solved by storing them in popular open source SQLite database. AshutoshTripathi& Ashish Srivastava,Online Library Management System, IOSR Journal of Engineering (IOSRJEN), Vol. 2 Issue 2, Feb.2012, pp. 180- 186. 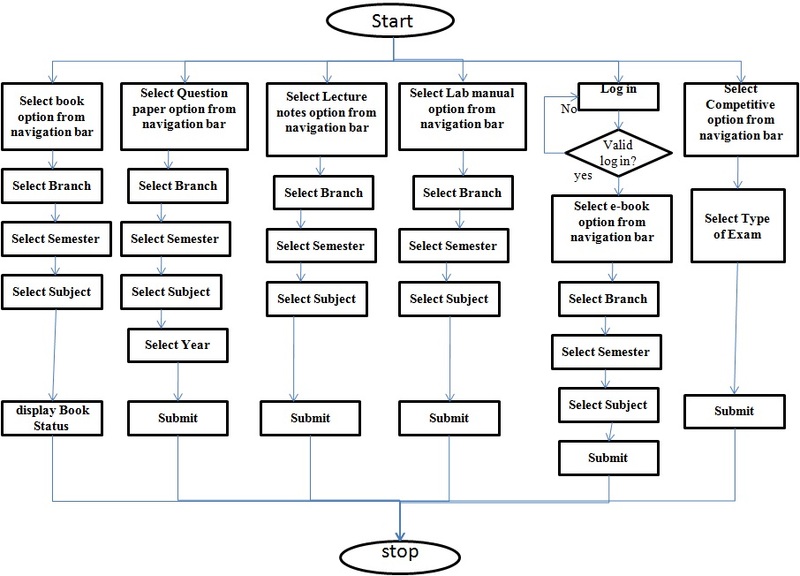 C. Srujana, B. Rama Murthy, K.TanveerAlam, U. Sunitha, Mahammad D.V, P.Thimmaiah,Development of RFID Based Library ManagementSystem Using MATLAB, International Journal of Engineering and Advanced Technology (IJEAT)ISSN: 2249 – 8958, Volume-2, Issue-5, June 2013.